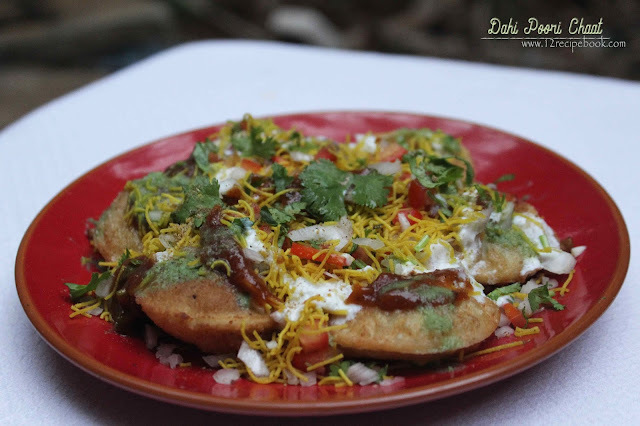 Dahi poori chaat is a popular North Indian Street Food. The crispy tiny poori is loaded with a bunch of yumminess inside. 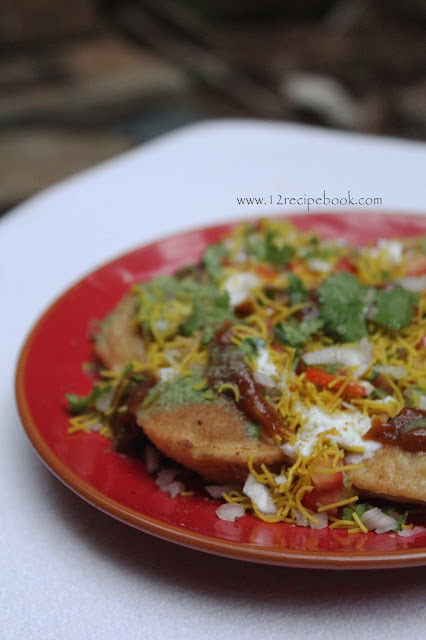 It is hard to find a person who resist this lovely chaat. Assemble all the ingredients and start making chaat! There is no more ruling in making them. Fill the poori with all ingredients. The amount of ingredients adding is always up to your taste. Crack the top of the tiny poori to make a fine hole to fill. 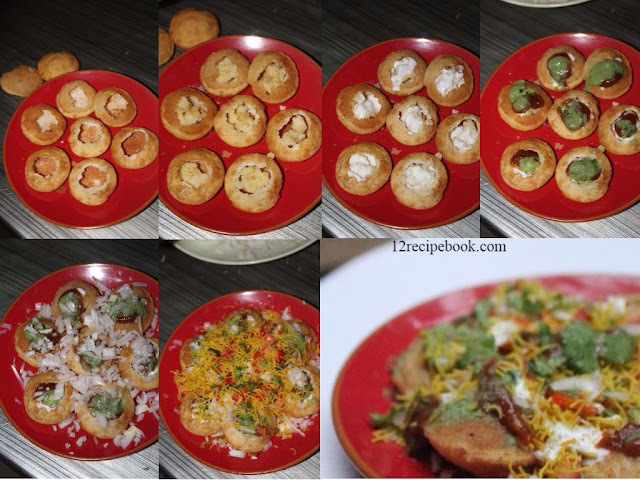 Add a teaspoon of mashed potato inside each poori. Sprinkle a pinch of chaat masla on top. Above that add a tablespoon of thick curd. Add two teaspoons of sweet chutney and green chutney. Now sprinkle thinly chopped onions on top evenly followed by tomato and coriander leaves. Sprinkle some more chaat masla and little salt. Sprinkle some more sweet chutney, green chutney and thick curd for garnishing. Lastly sprinkle thin sev and serve soon. Mix semolina, flour and salt. Add warm water little by little and and knead well for 6-7 minutes until a smooth and stiff dough is formed. In a smooth surface roll it in to a thin big circle as possible. Cut out small circles from these by using a bottle cap or by using the sharp edge of a steel glass. Remove the seeds of tamarind and dates. Cook tamarind and dates in a pan along with ¼ cup of water and ginger piece for 7-8 minutes until cooked well and become tender soft. Remove the ginger piece from it (avoid). Switch off the flame and allows to cool down completely. Pour in to a blender and make a fine puree out of it. After that add, chilly powder, cumin powder and salt in to it. After cools down; store it in a container for long use. Blend all the ingredients in a blender by adding little water to make a smooth chutney..